Like Inception, it must have felt like a dream within a dream when for the first time ever in a FIFA competition at senior level, the tune was picked for Tahiti’s national anthem. As the anthem played on, there was emotion all-round the Tahitian players. Some were almost close to tears. Their manager, Eddy Etaeta visibly was. It was, as he would later say, a realisation that while for years Tahiti was always restricted to watching FIFA competitions on television, here they were on the grand stage. Actors themselves ready to play their part. Be it, a predictable one. By the fifth minute, they had conceded. By the 10th, they had conceded another. And by the 26th, a third. This was the realisation of the reality. Facing Nigeria, a seasoned team with seasoned players, African Champions, and professional footballers, there was more than a huge gulf in quality between the two. As such, it was still great to see them score. In the 54th minute, Marama Vahirua’s corner was headed in at the back post by Jonathan Tehau. Celebrations ensued, including a choreographed one which saw them mimic the rowing of a boat. The fact that they had a choreographed celebration points to their determination. Nobody (except the most optimistic of their nationals) had expected them to even manage to score a goal at this tournament. That they ignored that and went ahead to make up a celebration move proves the premeditation of their belief that they could score. In that, they had defied the odds. But the punctuation to that only proved a minor pause in the proceedings. The rout continued, and minutes later, the same two players combined to score on the wrong end. Vahirua’s attempt to prevent a cross from the left only took it further away from goalkeeper Xavier Samin, with Tehau applying the final touch that put it into the Tahiti goal. 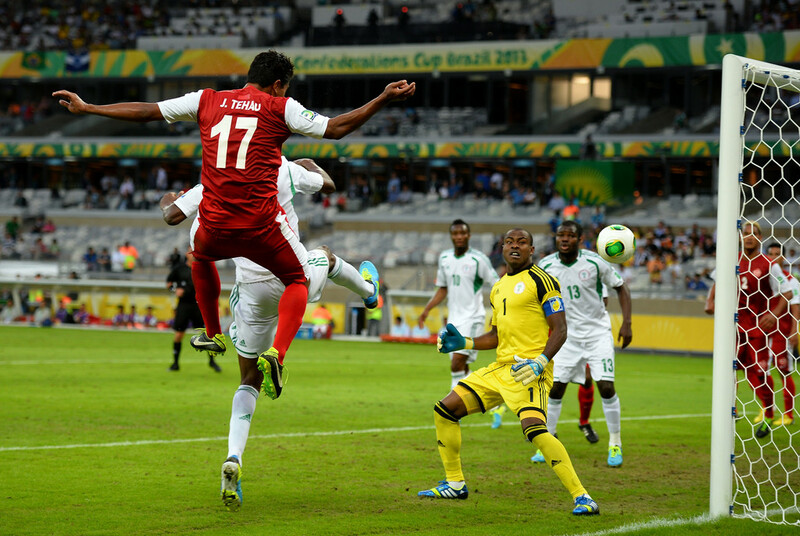 Nnamdi Oduamadi then completed his hat-trick, before Elderson Uwa Echiejile completed his brace. The final score read 6-1, in favour of the Tahitians’ opponents. This game pointed to the vast difference in quality. In inequality and a despairing professionality. Nigeria are not world beaters, yet by having all its players as professionals, they were superior in every other way. Technically, tactically, physically, mentally, clinically, positionally. There was no match in prospect, and even where there was, there was no chance. This contest was over long before it even became one. And while the Nigerians’ motorboat motored past the Tahitians’ rowing boat, it will be interesting to see what Spain’s concorde will do. Before then however, this will remain a tale to be told. Tehau will obviously remember this story of how he scored Tahiti’s first ever goal against a team outside the Oceanic region. His teammates will remember how they stepped onto the pitch, took in the atmosphere and exhaled nervous sighs. In the end, this is no underdog story. This is no David vs Goliath narrative, nor Leonidas vs Xerxes. This is a story predestined to have a predictable ending. An opponent facing many Alexanders, and subject to Hannibal brutality. Unlike a fairy tale, there will be no happily ever after. Do not, however, discredit their hard work. They have done all that was required of them to make it here. Winning the Oceanic Cup was no mean feat, especially as they had to do it by defeating favourites New Zealand in the semi-final, and rivals New Caledonia in the final. But by excelling against teams of such low quality, they now find themselves in a position where they will not, and cannot be able to excel against teams of other, higher quality. The Confederations Cup may provide an equal chance to all by allowing every confederation a chance to field one team. But in terms of quality, equality does not always equate to balance. Never blame a man for wherein and what time he is born, and man is nothing but a product of his time and circumstance. Time and circumstance is however proving that Tahiti are here to enjoy the beautiful Brazilian scenery rather than forge a successful history against its backdrop. It is not their fault in any way. Tahiti are the no doers, but they do not however degrade this competition. As an inexpiable facet of life, we all love to believe in fantasies and hopelessly hold on to the belief that they will come true. Tahiti’s presence in Brazil is clear indication of this. They however are a personification of the truth that is George Orwell’s allegory. Some are more equal than others. We on the other hand continue in our hopeless belief that this is not true. Humanity though is littered with beliefs that even when proven to be true are vehemently disbelieved. Reality, it seems, is stranger than fantasy. Next Next post: BRAZIL V SPAIN : THE DREAM FINAL?